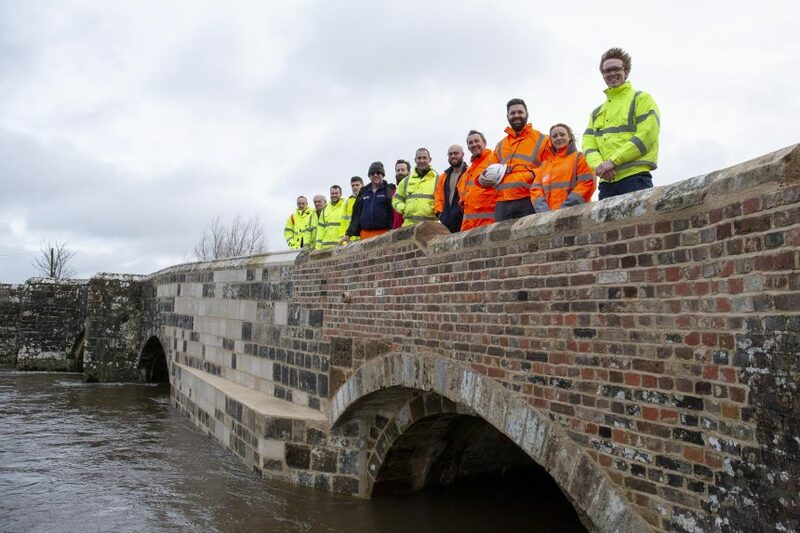 Dorset County Council engineers have celebrated the successful repairs to Wool bridge with their partners and contractors. The ten-month project employed specialist equipment and professional expertise from the public and private sector to ensure a sympathetic and long-lasting repair to the Grade II Listed structure. Emergency stabilisation of the bridge in January with gabion bags of stone was made possible with the assistance of South West Crane Hire. Engineers from Dorset Highways designed the repairs required, with work lead by county council operatives and supported by Mark Farwell Plant Hire and G&P Services. Access to the damaged area was provided thanks to OnSite Portadam and pedestrian access maintained with a temporary footbridge set up by South Western Scaffolding. Essential sheet piles, to protect the bridge foundations from future erosion, were supplied and installed by Suttle Projects. Mabey Hire supplied the formwork for the new concrete retaining wall, and provided technical assistance during its construction. Throughout the works, Wessex Archaeology has provided a ‘watching brief’ in case of any significant finds and to chart the history of the notable bridge. Damaged stonework was replaced with stone provided and cut by Haysom Purbeck Stone, and the original lime mortar was chemically and microscopically analysed and replicated by Rose of Jericho. Although the damaged wall and arch of the bridge have now been reinforced and repaired, the road surface over the bridge will be resurfaced next week – completing the project. The bridge will be closed to pedestrians and cyclists from 9am to 4pm on Wednesday 5 December so that the asphalt can be laid in one section.